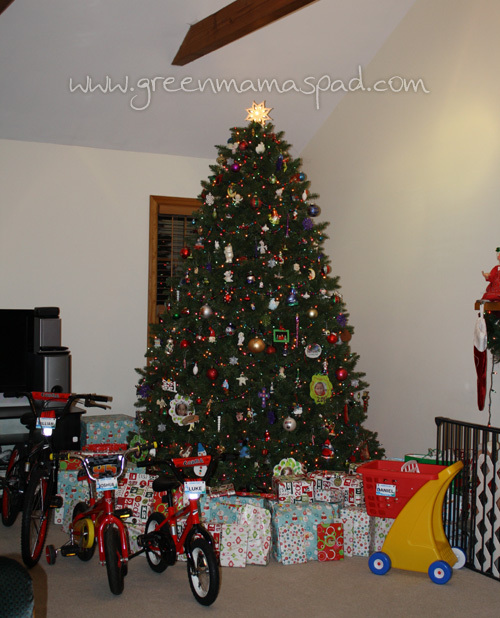 Christmas Eve, after the kids were in bed, my husband and I spent the night getting all the presents under the tree. He assembled the bikes and then I neatly placed everything around the tree. Then thanks to a giveaway I won from Dawn's Daily Diggs, I uploaded a photo to ICaughtSanta.com and downloaded my free photos of Santa in front of our tree. The kids got a kick out of it. I love it! I just showed my kids the picture you caught. They are impressed! OMG, that santa shot is awesome!! what a great looking haul! 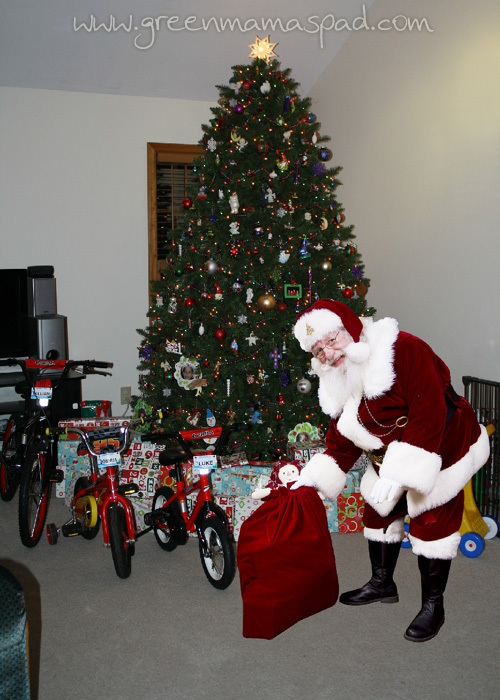 Very cool picture of Santa! It looks like you caught him! Such a pretty tree and I love the photo with Santa! Very cool that you had everything assembled and ready to go. I bet the kids had a blast! Great photos... I love the ornaments, they remind me of some of mine. I love homemade ornaments from the kids. I still use the ones they made me from when they were in Kindergarten onward and they are now almost 21 & 24. The memories never go away. Merry Christmas and happy new year to your family. HUGGLES! So pretty and I love the Santa pic. My kids would love it! Looks like a long night for mom and dad! Love the Santa pic! Your photo turned out great! I love the tree. That's awesome! Great job on the tree! Great job! What an awesome tree! so beautiful and WOW all your kids got knew Bikes now that's a Christmas! Lots of bikes, I hope you didn't have to put them together Christmas Eve! I love the idea of icaughtsanta. Too cute! I love it - proof Santa was there!